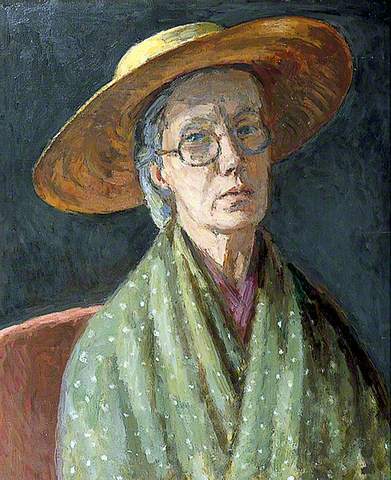 Last Friday we travelled from Bloomsbury in Sussex to its origins in Bedford Square to hear one of the first Charleston attic interns, and current Paul Mellon Centre for British Art Postdoctoral Fellow, Dr. Hana Leaper talk on Vanessa Bell’s self-portraiture. We stepped inside the Paul Mellon Centre for British Art’s newly refurbished interiors, leaving the golden autumn leaves falling from the trees outlining the park onto the crisp pavement outside. We moved through to the seminar room and sat around a large oval table ready for Dr. Leaper to begin her talk. Leaper opened by detailing Vanessa Bell’s artistic and aesthetic maternal ancestry, examining how Julia Margaret Cameron’s pioneering photography memorialised her niece Julia Stephen (nee Jackson) – Vanessa Bell’s mother – as an icon of Victorian feminine beauty. Leaper examined how Bell inherited her mother’s image as “the angel of the house”, only to radically complicate this representation throughout her artistic career. She highlighted this tension between Bell’s image as the mother of Bloomsbury, mythologized as silent and serene, and her identity as a self-conscious and articulate member of the Modernist avant-garde. Leaper examined Bell’s first known finished self-portrait from 1912, where she captures herself in the act of painting, surrounded by the homely accoutrements of the drawing room at Gordon Square. A black outline separates Bell from the background, boldly pressing her image into the foreground. Distancing herself from the bookcase that adorns the wall behind her, Bell at once distances herself from her family’s literary heritage. Confidently wielding a paintbrush, Bell asserts rather her identity as an artist. By obscuring her face – as she does too in a later 1952 self-portrait, also discussed by Leaper – Bell resists not only her literary background, but also her legacy of feminine beauty. Leaper went on to highlight Bell’s recurring emphasis on a particular ligament in her neck, a line paid equal attention by Julia Margaret Cameron in her portraits of Julia Stephen. Used to index strength of character, and made all the more prominent by the obfuscation of all other facial features, Bell uses this familial physical idiosyncrasy to resist classification as a Burne-Jones “beauty”. Bell thus highlights the strong feminine features that define her maternal lineage, drawing attention away from their definition as “angels of the house”. 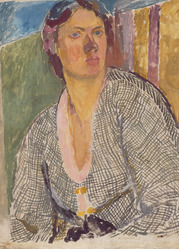 Leaper moved on to compare Bell’s self portraits to portraits painted of Bell by Duncan Grant and Roger Fry. She argued that these portraits, by men central to Bell’s life, lacked the psychological complexity that she communicates in her own self portraits. Grant and Fry’s portraits were thrown into particularly sharp relief by Bell’s 1915 self-portrait. Here Bell’s face absorbs the colours of the backdrop, an arrangement strongly reminiscent of the abstract works Bell was working on concurrently. Bell once again incorporates her art practice into the imagery of self-portraiture, thus claiming the centrality of her creative work to her identity. A defiance, moreover, radiates from the image: her pose is awkward; her figure fills and threatens to spill out of the frame. She is monumental but not statuesque. Yet Grant and Fry, painting her portrait at a similar time, attribute to Bell the poise and classical beauty of statuary. With self-portrait and portraits placed side by side, Leaper uncovered the extent of Bell’s rebellious representations. She is three dimensional and dynamic, often difficult, confrontational and restless. Her essence cannot be captured. She is like Virginia Woolf’s “will-o-the-wisp” in her essay on fiction Mr Bennet and Mrs Brown who tauntingly says “my name is Brown. Catch me if you can”. Underpinning Leaper’s thesis was the notion that Bell’s later works deserve greater critical attention. Leaper compared Bell’s final known finished self-portrait, which hangs in the garden room at Charleston, to other late self portraits by artists such as Chardin and Rembrandt, thus re-contextualising her work within the art historical canon. While these self portraits by male artists were revered as great works, demonstrative of their maturity, Leaper suggested that Bell’s equivalent has been frequently obscured by biographical readings, seen by many to represent her suffering after the death of her sister Virginia Woolf and eldest son Julian Bell. Perhaps, Leaper concluded, a wider cultural hostility towards older women conditioned this response, as it could be better understood as a defiant act of self-expression, in keeping with Bell’s other self portraits. We would like to thank Dr Hana Leaper and the Paul Mellon Centre for a fantastic and illuminating research lunch. An exciting new understanding of this artist’s self and work for me! Thank you!